It’s the beginning of the year and it is time to get organized. Everyone takes this time to get their home organized and get everything in order (which we are definitely doing and you can too with tips you can find here), but we think you need to think about organizing your online life as well. We are taking the month of January to finally update all of our online info and get our website launched. All things we had planned to do in 2014, but never found the time for. We are starting off with updating our About Page on the blog here. You should always have an interesting and updated about page that will make people want to read your blog. This should also be updated every now and then or whenever you have a major business, product, or personnel change to keep your readers up to date on. 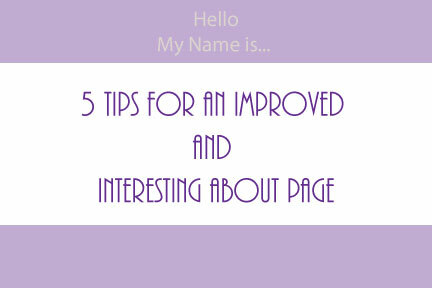 So take today and tomorrow to read over our tips on how to write an about page that will keep people interested, take a look at our current about page (which desperately needs improvement) and then check back on Thursday when we reintroduce ourselves to all our readers and unveil our new (and improved!) About Page. Be sure to inject your personality, but start off talking about what you have to offer your readers, not yourself (you will get to that later). People want to know what it is they will be reading. Let your readers know what you do on the blog and what they can expect to see. Give them a reason to check back each time you post something new. Link back to some of your favorite posts while explaining what you do. This is a great time to showcase some of the most popular posts you have done, or even just your personal favorites. Now it’s time to tell people about you and anyone else that is working on the blog. People want to know who you are and get a sense of your personality. Use this time to be you, write in your own style, if you are funny be funny, if you are a little quirky let the readers see that. Include pictures. People like to put a face to the name and want to see who you are. Choose pictures that fit with your brand and who you are. Lastly, include contact information. This is a great time to link to your social media accounts to build your audience there. Leave an email address where people can send you feedback or get in contact with you about collaborations. Do you have an email list? Add a sign up somewhere on the page so those who read your page and want to stay updated can. We are the first to admit our current about page pretty much does none of the things we are telling you to do, but we have fixed that and will show you all the new and improved F.I.N.D.S. About Page on Thursday. See you then!